Kiah Stern (left) and Catherine LeFrere in "Indecent." While taking our seats at Victory Gardens Theater, a group of actors huddle in an intimate circle, strumming away to Yiddish folk songs. Their performance gives the audience a perfect entrance into the divisive world of 1920s Broadway glamour and conservative politics. When the musicians leave the stage, the lights dim and a row of actors swiftly enter, spilling ash from their large rugged overcoats—a stark shift in mood that can only be understood later. Written by Paula Vogel and directed by Gary Griffin, Indecent follows a theater cast navigating its way through the homophobic and anti-Semitic reaction to the release of the play they perform, God of Vengeance. Written by Sholem Asch, a Polish-Jewish playwright, God of Vengeance showcases the budding romance of two women, Rifkele (Kiah Stern), a brothel owner’s daughter, and Manke (Catherine LeFrere), one of the prostitutes. We witness how the the cast of that play (within the main play) must undergo the criticism of both Jewish and American communities. With the progression of the storyline—where we witness the tribulations of the characters that exist both in and out of Sholem’s creation—we come to learn about Sholem’s voice and how he strives for more than just creative respect. God of Vengeance depicts the lovers as they fight against the odds of both society and Rifkele’s abusive father. It is a tale that seeks to humanize the marginalized of society. Outside the storyline of Sholem’s work, the Jewish actors endure America’s wave of 1920s xenophobia and, as a result, come to a deep understanding of the respective positions of their characters. As Lemml (Benjamin Magnuson), the character of the director of God of Vengeance, describes, God of Vengeance’s actors live “in a country that laughs at the way that [they] speak,” while their counterparts live in a world that fails to recognize the purity of their love. Indecent depicts art’s power to change minds and offer an escape from religious and societal responsibility. It is only through their art that the cast can construct a world where the marginalized are able to run from the pressures of their time. Where in real life they are left to perform in miserable ghetto attics, in God of Vengeance they can exhibit the freedom of spirit that they crave. Mini theatrical dances are juxtaposed with the somber reality; glitter stands next to ashes as the lives of these characters constantly shift over the course of the production. Their relentless loyalty to their craft brings them deeper into a chaotic dilemma with the law and their religion. Through an act of defiance, they demonstrate art’s ability to present a less oppressive world. 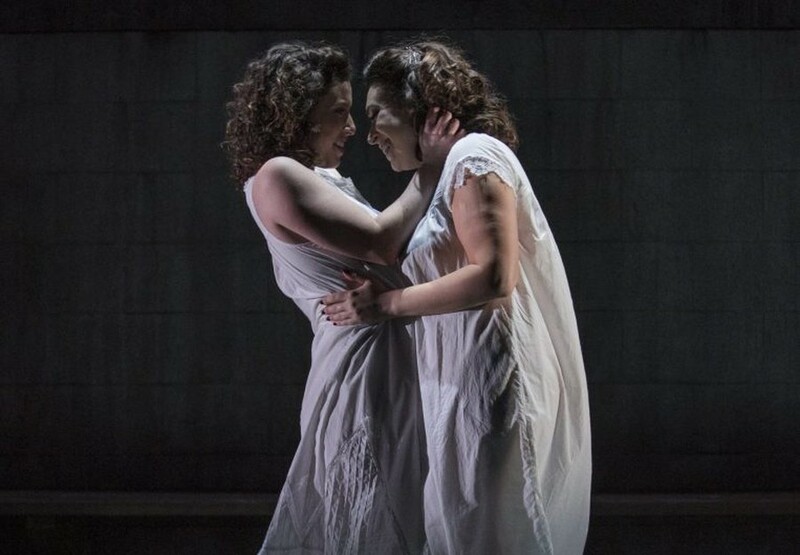 The lesbian relationship within the play is not consumed by politics or religious stigmatism against homosexuality, but by infatuation for another individual. The 1920s world of Indecent, not ready to look beyond its skewed views of love, could not accept a play that showed the loving reality of this politicized issue. Indecent, even with its important message, is far from flawless in execution. The music acts as a double-edged sword—musical scenes help develop a sense of community but also feel disjointed in places of emotional climaxes. Actors often stumble through their lines as they struggle to wrap their tongues around tricky German vocabulary (accompanied by projected subtitles). Despite these imperfections, the ensemble still holds significant charm. Their unabashed enthusiasm to inhabit different characters and provide the audience with a mix of comedy, tragedy, and flair was a joy to witness.